When it comes to storage, most people think of a lifeless room with a steel shutter door.It does exactly as its name suggests, but little more than a what a garage of storeroom would serve as. However, there are many ways to consider how we use storage units or rooms. And the only limiting factor for their use is your imagination. With some forward-thinking, you might find some surprising results. Matlock Storage works with hundreds of domestic and business customers in Matlock, Chesterfield and Derbyshire. Many start-ups and entrepreneurs work from our storage depot and use their unit as their workspace. It’s a relatively new trend that helps people with limited funds and ability to rent a commercial property start their own enterprise. If you want to safeguard your company’s equipment, products or any other valuable items, storage is the most secure choice. However, storage units can serve as much more than just that. Over the last five years, people have been using storage units for their business. E-commerce freelancers often use Matlock as their stock control room. And many of our start-up clients rent units that act as their office. The reason why using storage as an alternative workspace can be positive is the cost. Renting a storage unit in comparison to commercial rental prices are significantly different. A lot of businesses would struggle to find a suitable building due to the high costs of commercial rental properties. Fortunately, a few savvy entrepreneurs saw an opportunity to save money. The set-up of your alternative workspace is easy. All you need is some basic office furniture and a computer, and you have yourself a no-thrills office. Matlock Storage has Wi-Fi access in our branch, and you can also install an LTE router for a stronger connection. You can use half of your unit for stock and equipment storage, and the remainder as your office. Matlock Storage caters to customers from all over Derbyshire, many travelling to store with us instead of local providers. That’s because we pay attention to each person’s storage requirements to make sure they receive the right service. We have storage packages for business and domestic customers, all at affordable prices. By keeping our rates below the industry standard, it helps customers maintain their monthly expenditure. Not only that, it’s easy to upgrade or downsize your storage unit if your needs change. We have various options available for storage unit sizes. You can access your self storage unit whenever you want to during office hours. Additionally, we have onsite mailboxes available, as well as a Receive and Dispatch service. Furthermore, we have free parking, beverage and WC facilities onsite. Our loading bays are perfect for unloading equipment, products and tools into your storage unit. Matlock Storage works with hundreds of business customer every month. We make a point of getting feedback from our business clients to make sure we’re covering all bases with our storage packages. By doing this, we can build relationships with our customers, and they know us by name, which makes a big difference. 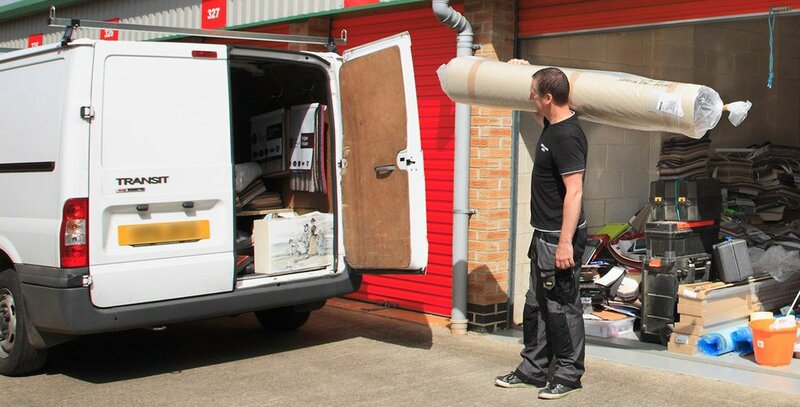 We’re confident that we have the right business or home storage service to suit everyone’s needs. With free parking and convenient loading bays, you’ll find storing with Matlock is all about efficiency and a high standard of service. Security is something we take seriously at Matlock Storage. We have 24-hour CCTV cameras throughout our facility, in addition to RedCare alarm monitoring and police response. There is keypad access to individual rooms, as well as internal lockable rooms. Our staff all have security training and are always vigilant to any security risks. The Matlock team also offers a free Move-in Van Collection service to help you move everything into your storage room. At Matlock Storage, we always keep our prices as low as possible to make sure everyone can afford storage. From as little as £5 per week, you can rent a storage room with us. If you’re looking for an affordable place to start your own enterprise, contact us today. We guarantee that you’ll thank us for helping you find an affordable workspace.